I am so honored to be Guest Designing for the Crop Stop Blog today. I found a simple Step Card tutorial by Loll Thompson on Pinterest and used that for my card base. 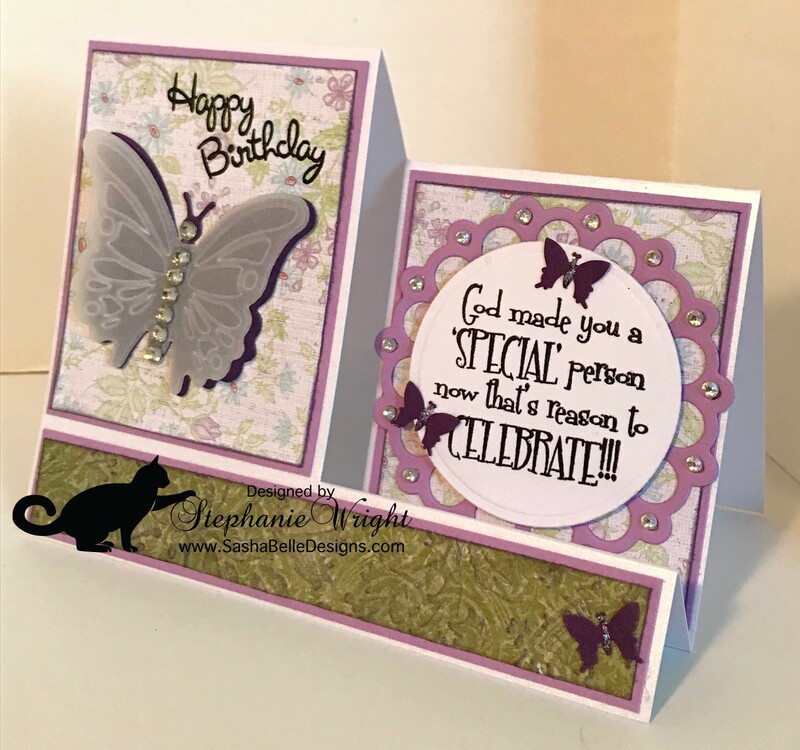 I decided to make this a birthday card for a friend who likes purple and also likes butterflies. I really enjoy this step card design because it still allows room to write a message on the interior. After following the tutorial to make my card base, I cut solid cardstock slightly smaller to mat patterned paper. I inked the edges of the patterned paper with Distress Ink for extra dimension. The green patterned paper strip across the bottom front of the card was embossed with an embossing folder. After inking the edges of this strip, the embossing was also highlighted with ink to really help it pop. The sentiment on the right side was stamped with Versafine black ink and heat embossed with clear embossing powder. A Spellbinders circle die was used to die cut the sentiment which was then matted on a Spellbinder Picot Edge Circle die cut. After adhering these to the panel, the circles were embellished with clear bling. 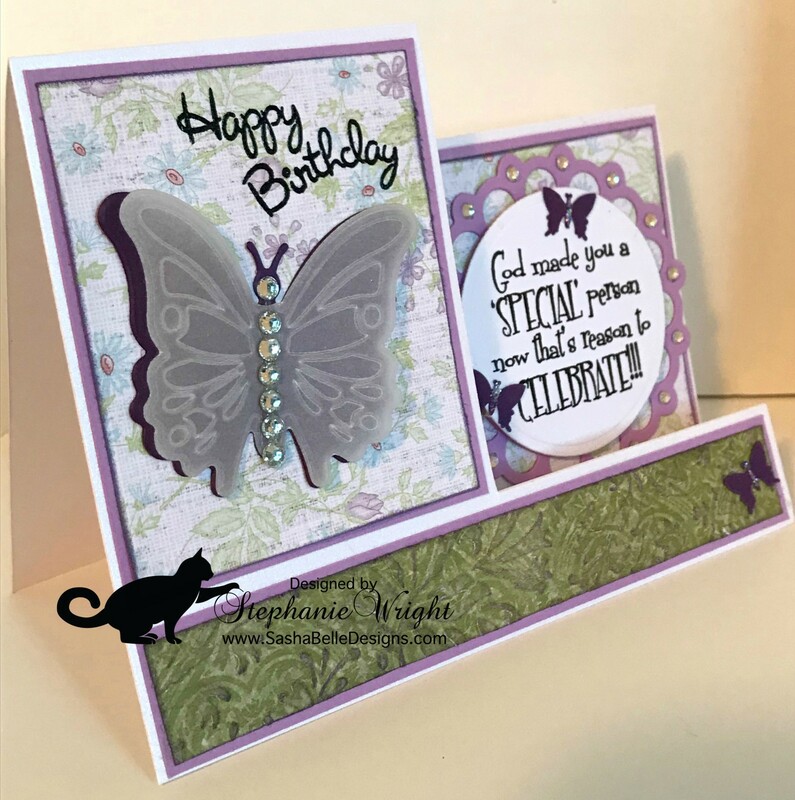 The sentiment on the left was stamped directly on the patterned paper and then heat embossed with clear embossing powder. 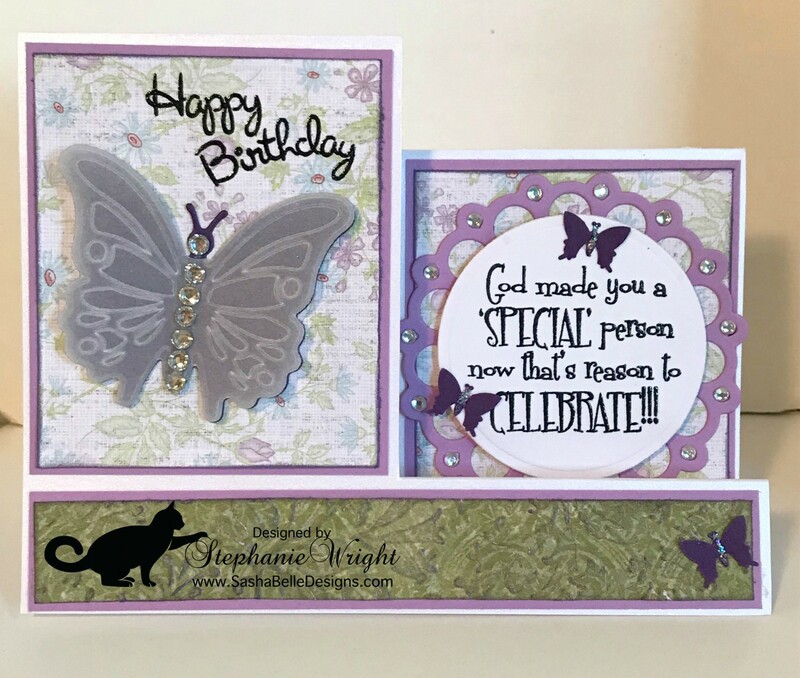 The small butterflies were punched from dark purple cardstock with a Fiskars punch. The centers of the butterflies were accented with Stickles. 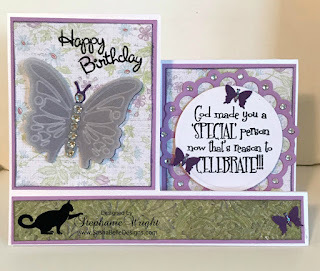 The large butterfly was die cut with a Momenta die from cardstock and then from vellum. The vellum layer was also embossed with the coordinating embossing plates. The vellum layer was adhered to the cardstock layer only in the middle. After adhering the large butterfly to the card, it was accented with clear bling. Thanks for visiting, I hope you'll come back again soon. Thanks to the wonderful folks at Crop Stop for letting me Guest Design for them today. I'm so happy you could guest design for the Cropstop blog this week! Thanks for sharing this beautiful step card with us! I have been saved by grace through faith in our Lord Jesus Christ. I have been married to my wonderful husband for 34 years. My husband is a bi-vocational pastor. We enjoy working together in the ministry and singing together. We have been blessed with a son and a daughter. Both of our children are married. Our son and his wife are the parents of our precious grandson and granddaughter. Our daughter and her husband have our grand-puppy, a Corgi. I started my paper crafting journey with scrapbooking and gradually expanded into altering items and card-making. I dabble a bit in digi-scrapbooking and use quite a few digi stamps. This blog is to share my crafty projects with friends and family. Stephanie Wright - That's Me!! See Recognition Page for details. All content (including pictures, text & descriptions, designs & projects created by me) is copyright ©Stephanie Wright. If you use any of my designs, projects or tips, please give credit where credit is due. Thanks for your cooperation. As a Design Team member I sometimes receive free product. I also occasionally receive free product for review from other companies. I will make note in my blog post when this happens. I only use products I genuinely enjoy using and will give an honest review of these products. I belong to the Amazon affiliate program and will use affiliate links when possible.